DERRY'S Guildhall clock will light up red and white this evening to reflect the favourite football colours of the three children who died in the Buncrana drowning tragedy. Derry City and Strabane District Council agreed to turn the Guildhall clock the red and white colours of Derry City and Manchester United Football Clubs as a mark of respect to brothers Mark McGrotty (12) and Evan McGrotty (8) and their teenage aunt Jodie Lee Daniels (14). The three children will be laid to rest at the City Cemetery in Derry this afternoon as will the boys' father Sean and Jodie Lee's mother Ruth. 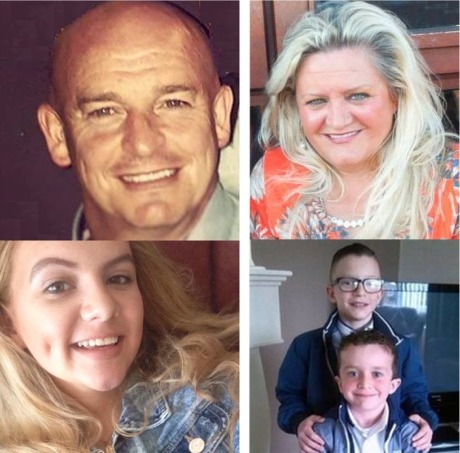 All five died in a devastating accident at Buncrana Pier last Sunday evening following a day-trip to the seaside town. Derry Mayor Cllr Elisha McCallion said turning the Guildhall clock red and white and the council premises red is "a symbolic gesture of support and reflective of the huge outpouring of grief from the local community". “The two boys were massive Manchester United fans. Their uncle Joshua Daniels plays for the local Derry City FC and the boys and Jodie-Lee were passionate about the sport. "I spoke to Louise today at the wake and she spoke about Evan and how he was obsessed with the colour red, it was his favourite colour. He loved red clothes and all the things in his room are red. We feel it’s a fitting tribute to their memory to have the lights on the council offices and the Alley Theatre turned red as a mark of respect,” she added. Earlier the council cancelled its monthly meeting as a mark of respect to the families. “The council is very much aware of the impact the tragedy has had on the local community and is taking every opportunity to show support for the families and the wider community who are affected by it,” she added. Expressing her condolence at the tragic deaths, she said: “This tragedy has affected the entire community in Derry and Donegal and left all of us feeling distraught. My heart goes out to everyone affected by this tragedy, especially to Louise. I can’t imagine what she is going through right now, it is just unthinkable and every mother’s nightmare. The communities in Derry, Donegal and wider North West region are united in grief today and by working together we will help each other through this harrowing time and will continue to offer support to the families in the weeks and months that follow the funerals."